The first thing Christian Chabot, our then-CEO, said to me when I joined Tableau was, “I’m so glad you’re here to help. Our customers really need alerts." I could see the need was real, but what was the root cause? What was the underlying business problem people wanted solved with alerts? Our team hit the road to learn more. From finance to construction, manufacturing to retail, health care to high tech, we met with customers to understand their use cases. What we learned: People needed our help to save time. That journey reminded us that people are busy and don’t always have the bandwidth to check in on dashboards to see if things are on track. We heard that people look to dashboards for certain data, even when the dashboard includes many views. People told us that subscriptions are good, but they weren't smart enough, telling them whether or not the data they truly cared about was updated. We learned that our customers want Tableau to tell them if there is an important change in their data automatically. Alerts need to work on their existing data, and they need to reach them using their primary work notification channel: email. Back in the office, we asked ourselves how we could design alerts to be both powerful enough to address underlying business needs our customers had, and approachable enough for non-authors to understand and use. Tableau is about seeing and understanding your data with intimacy. To retain that personal connection, we developed a plan to enable users to create a data alert directly in the context of the data they already have. Select the axis you want to alert on. Click the Alert button in the toolbar. Choose the trigger condition and when to send it. Those of you who attended or viewed my talk at Tableau Conference may remember that our early builds supported only unstacked bar charts. We’ve since expanded the feature's functionality to enable alerting on vizzes of any type, stacked or unstacked, as long as they have a continuous numeric axis. These include line charts, area charts, scatter plots, and shape charts in both standalone vizzes and dashboards. Alert owners can sign themselves and any other users up to receive alert emails in Tableau Server. Each recipient manages their own alert preferences with one click, directly from the email. Alerts you own or receive appear under My Content in Tableau Server, where you can customize your preferences. Site administrators can choose whether to enable or disable alerts for their site in Site Settings. As a site admin, you can view the list of all alerts created on a site, set the owner, edit, or delete the alert. 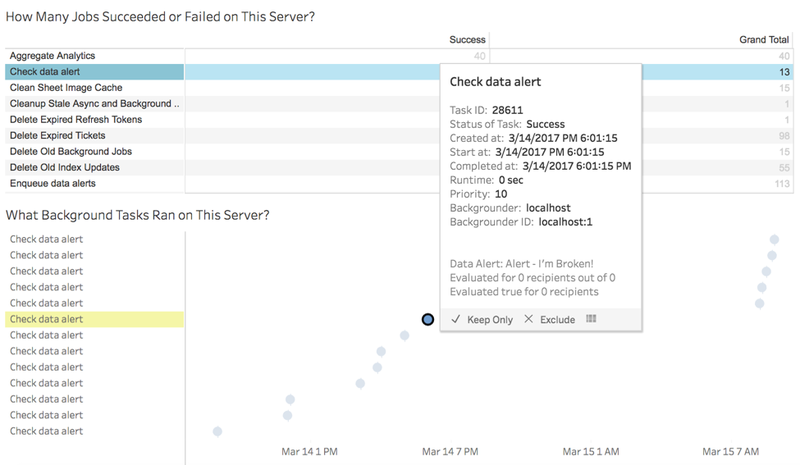 With new administrative views, site admins can see which alerts are running on their server, how frequently, and if there are failures in the Backgrounder status for Non-Extract Tasks admin. Alerts are also checked automatically for extract-based views whenever any extract in the workbook is refreshed. I hope you find this first step on the data alerts journey useful, and I’m excited about the opportunities for continued investment to make alerts even easier to use and more functional. For instance, it would be nice to select and alert directly on a specific mark or a value in a text table. Early testers have asked for self-service alert check time scheduling. Many would like to send a dashboard other than the one which triggered the alert. 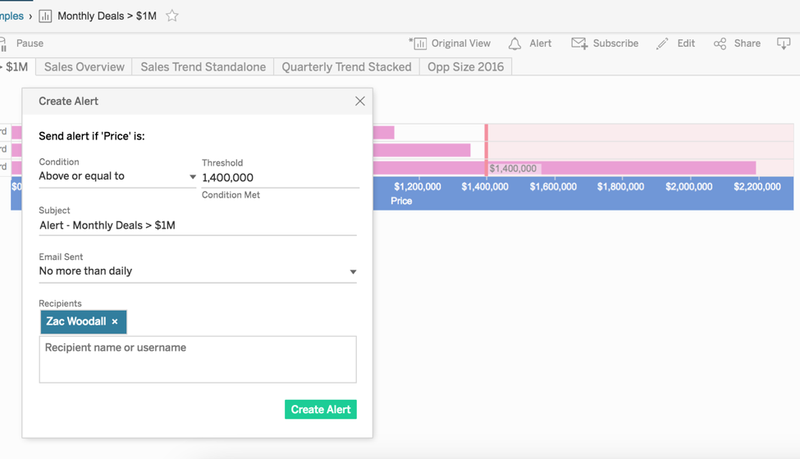 The good news is we plan to keep investing here, to bring you more value in each release—including bringing data alerts to Tableau Online, and deep linking from alert mail directly to the Tableau Mobile app. If there are key capabilities you’d like to see, please let us know by submitting your comments in the Ideas forum on the Tableau Community. I want to extend special thanks to those of you who took the time and energy to teach our team about what you needed, especially those in our internal Alpha group who went above and beyond to deploy and evaluate pre-release versions of this feature. 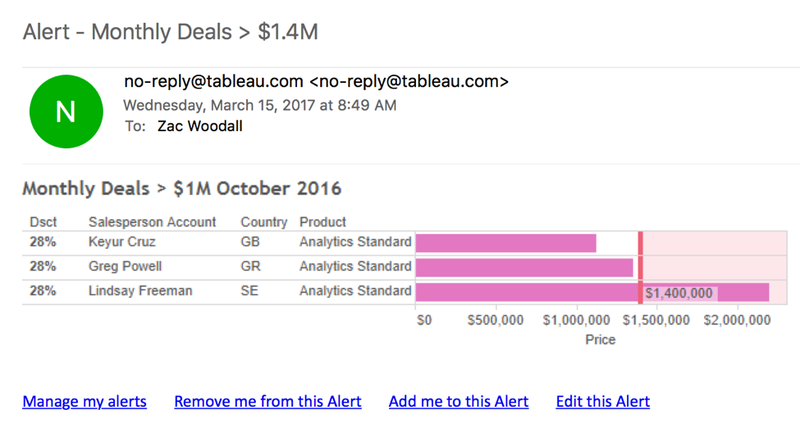 At Tableau, we strive to deliver product improvements that solve real problems, and your guidance and feedback was instrumental to understanding the use cases for data alerts. This is for Tableau Server only - not available with Tableau Online currently! When is this planned to be available in Tableau Online? I am interested in this as well. I searched the communities but could not find an answer to this. I am also very interested in this as a Tableau online feature! When can we expect this to be available in Tableau Online? A support that was missing but now we have it, so take advantage of it. This is really a good and essential option, Appreciate if you share an ETA of when this will be available in Tableau Online. This feature is almost required in every analytics solution ! I miss the alert button in all my storyboards. Do anyone has any idea? I only found this hint: Numeric bins and discrete numeric axes aren't supported. If I have multiple metrics how do i set alert based on particular measure. There is no option available. Just attended the roadmap webinar and if I remember it correctly content called Metrics will provide this functionality - KPI alerts. Is there anyway i can get the info about the roadmap webinar that you attended? The feature is a great idea but the implementation is rather disappointing. We still have a lot of cross-tab reports, and for those the feature cannot be used at all. Why not make it available for cross-tab as well? Is there a way to set up an alert that triggers when multiple thresholds have been met? i.e Visitors AND Revenue over x then send an alert? Is there any feature to get only one worksheet snapshot on email alert from entire dashboard? Is it possible to have the recipients of data alerts dynamically set? For example, in a report where you only want to notify a specific sales manager when their sales cross a specific threshold? If this does not exist, is there a plan to support something like this in the future?